Pictures have become a very important tool for story-telling these days and adding pictures to your post adds more weight to it. If you are a lifestyle blogger like me, it becomes imperative agenda of your story telling as the subject of your writing is heavily image dependant especially when you are talking about product features/reviews, events, tutorial and more. With the advent of smartphones, photography has become easier, convenient and accessible to all including people like me who do not like to use to DSLR or an additional camera. As a blogger, I prefer to invest in a phone with better camera and processing capability rather than carrying my bulky DSLR. A lot of time, I relay the original [read camera shot] images on social media especially while live tweeting/blogging or uploading it on Instagram. However, when it comes to Blogs and Online Intellectual Copyright or IPR, mere clicking and sharing do not suffice. 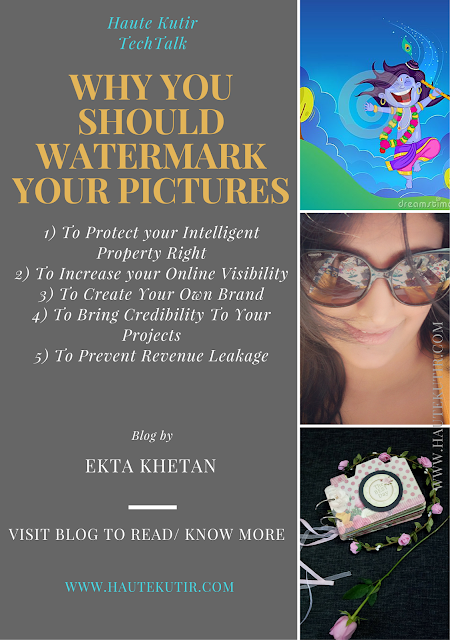 "watermarking" your images has become more important than ever unless you are ok to let anyone use your pictures for personal or professional use, without giving due credits [including revenue sharing in view of content monetization] to you. As a blogger, I click a lot of pictures for self and sometimes for others too. However, I was unaware of "watermarking" as a tool for IPR. I had my share of bad experiences where people used pictures clicked by me for professional usage without giving me credits or even seeking permissions. There is a thin line between using pictures for personal usage and professional usage. A credit is a must, whether you are a facilitator, friend or recipient, you must learn to give people credit for their work, especially in social media and writing. However, like I said, a lot of people are not educated enough to give due credits and it is often upon you to protect your work/credibility. Watermark becomes imperative in such scenarios and if you are a blogger or even an amateur photographer, you must add watermark to your images even if it may appear as big pain. We all know the importance of Pictures in our blog and invest a lot of efforts in clicking/ editing/ organising and adding pictures online. You can always use pictures from www or PR or professional photographer on your online document as long as you give due credits. However, when a reader sees that you have taken pains to click the pictures, and they attributes to your personal testimony, bringing more credibility to your work. We already emphasised on it. This comes handy when you are a visualizer or so, and the photographs are part of your business portfolio like Behance etc. I totally dislike and disrepute a person/firm that uses my work without due accreditation or permission. A watermark at a strategic place ensures your credit and seal even when used without permission. I shoot almost all my pictures and add a different angle to it without using photoshop or so. Photos on my blogs and Social Media are my narratives and part of my overall portfolio that I have created independently through personal R&D, self-improvisation, extraneous efforts. A lot of mature brands annotate this to the quality of your work. We have discussed this under IPR when someone uses your captured brilliance for a commercial purpose and earns out of it without giving you due credit, you risk your probable revenue out of it unless agreed upon. This happens largely with nature and wildlife photographers, travel photographers, food photographers amongst others. Those were my top 5 reasons for using a watermark on your pictures. Hope they were useful. 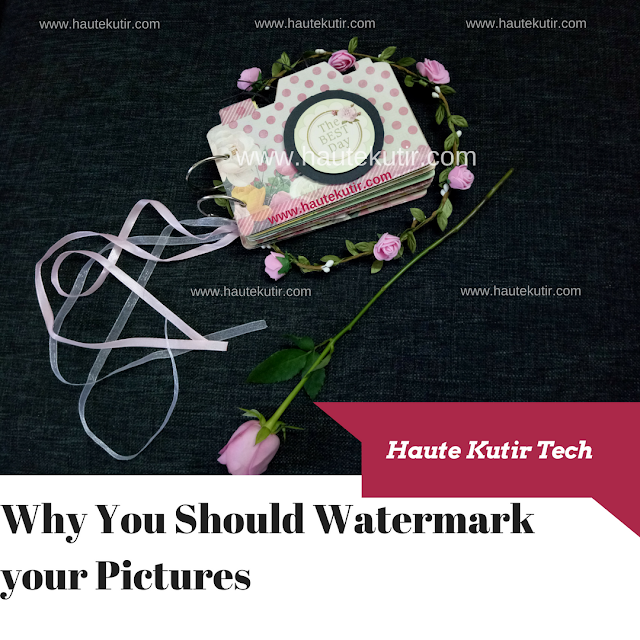 we have established the importance of using the watermark, it is equally important to learn about tools that facilitate the same. Selecting a right tool is equally important and to keep the objectivity of this post, we shall elaborate on this topic in a separate post [coming soon]. Do not forget to subscribe/ Follow me on Youtube | Twitter | Instagram | FaceBook for regular and interesting pictures and updates!